We would like to take this opportunity of thanking you for your custom in the past, and if you are a new customer to offer you a wide range of services that we hope you will find both attractive and satisfying. 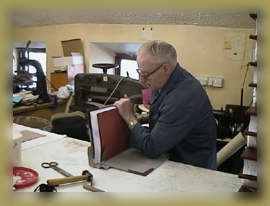 Dundalk Bookbinding is an Irish owned company producing Irish made goods. We offer a complete binding service to Universities, Institutions, Libraries and the general public, with a nation-wide collection and delivery service. The company prides itself in the quality of workmanship and attention to the customer's needs and it's Quality Assurance Policy.